Tonight the gals and I watched one of my favorite Christmas movies ever, White Christmas. Oh how I love that movie. 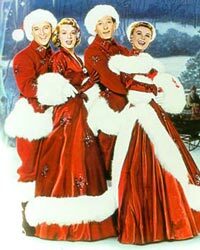 The music, the dancing, and of course the grandiose divaesque costumes with all that velvet, satin, sparkle and fur :) White Christmas was always a Christmas Eve tradition in our house. We'd all sit around between dinner and midnight mass watching Bing, Danny, Rosemary and Vera-Ellen sing and dance away. I remember as a little girl wishing that someday I could own beautiful dresses like the ones that Rosemary Clooney wore. Jen and I would often try to perform "Sisters" with Vera and Rosemary and Tutty would smile away and laugh at all of Danny Kaye's cheesy remarks. Tonight was great. Each of us had stories of how White Christmas played a fond part of our Christmas memories and how it was that movie that inspired us all to dream of someday wearing red satin fur trimmed gowns with the most important Christmas accessory ever - the white fur muff:) As we sat and watched tonight we all commented on the pretty dresses and sang along to all the songs:) Whatever happened to the good old days when actors and actresses actually had to have talent in order to be considered movie stars? What a great movie. I need a muff. I just blogged about this movie - I saw it for the first time this past week! My family would always watch The Grinch, all those claymation cartoons, but I never saw White Christmas. It'll definitely be a new tradition for me and Jamie - I loved all the dancing!